Designed by policers officers to keep citizens safe. The 120 dB Personal Alarm by Brite Strike sounds a loud alarm to scare off attackers and alert others that the wearer is in distress. The 120 dB Personal Alarm was developed by two police officers to reduce attacks on women. For security and peace of mind, no woman should be without the 120 dB Personal Alarm. The 120 dB Personal Alarm is made by Brite Strike, a leading manufacturer of tactical security devices for law enforcement and citizens. The 120 dB Personal Alarm was developed to give women added security when jogging or walking alone, particularly at night. The 120 dB Personal Alarm is equipped with the loud, screeching alarm plus a flashing red light to further draw attention to the wearer. A powerful LED white light is built into the alarm. The 120 dB Personal Alarm includes a break-away neck lanyard for convenience. The 120 dB Personal Alarm is a thoughtful gift for college students, joggers, and travelers. It gives its wearer a simple, effective way to scare off a potential attacker and alert others. 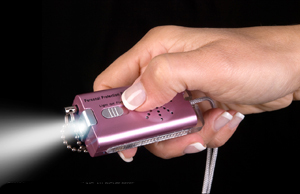 For even more personal security, get the Lightning Strike Personal Protection System, which includes the 120 dB Personal Alarm and an ultra bright tactical flashlight.